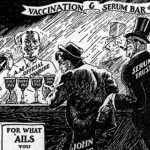 Most Jehovah’s Witnesses will be completely unaware of the Watchtower Society’s (WTS) once firm position against the “crime” of vaccination. During the centuries great plagues and illnesses have taken hundreds of millions of victims, sometimes even devastated civilizations. In the early part of the last century humanity was on the verge of a new age, when plagues as old as mankind were about to be extinguished. The tool was compulsory vaccination programs. Especially smallpox, one of the most deadly diseases in history, was targeted for extermination, and thanks to the vaccination program this was accomplished.